10 Reasons to love: Radiohead, Pyramid Song – music waffle. 1) The most striking thing about this song is that it has a very unusual time signature which makes it somewhat asymmetric and odd when you first hear it. It’s also almost super-natural in its ambience, and would work in a horror movie. 2) It was originally called The Egyptian Song, probably because it was written by Thom Yorke after a visit to an exhibition of Egyptian art during a two-week sojourn in Copenhagen in 1999. 3) The video is based on a dream that Thom Yorke once had. 4) Starting with the piano was a conscious move to vary their style at the time of being a guitar based band. Nothing wrong with a bit of re-invention. 5) Although we are told, “There is nothing to fear, nothing to doubt,” the fact is that at 2:03 is one of the eeriest notes I’ve ever heard. Strange noises are made by a theramin type instrument called an Ondes Martenot. 6) When the drum comes in, it has a slightly more conventional beat and somehow balances the song. The melancholy and deeply moving mood settles a little from this point onward. That’s a pretty hefty amount of intellectualism in one song. 8) Add to that imagery the myth of Greek underworld. “We all went to heaven in a little rowing boat,” is reminiscent of the journey of dead souls across the River Acheron. Only those buried with coins on their lips to pay the ferryman Charon were allowed across. Although the song starts as a pretty scary piece, there’s something comforting about the thought of dying with your special people around you as you journey to your final resting place. 9) In contrast to the rhythmic complexities, the song structure is quite simple – one verse sung through and repeated. There is no chorus as such just an “Oo-oo-oo-oo-oo”. 10) The string section was arranged by guitarist Johnny Greenwood and recorded in Dorchester Abbey. The band’s use of strings to create goose bump inducing surges in their songs is simply masterful. Altogether the individual elements come together to produce one of the most unusual and awe-inspiring songs of our time. Not one of my favourite Radiohead records – but then again, not favourite Radiohead is still superior to just about everything else! The word genius is over-used, but they are the embodiment of it! 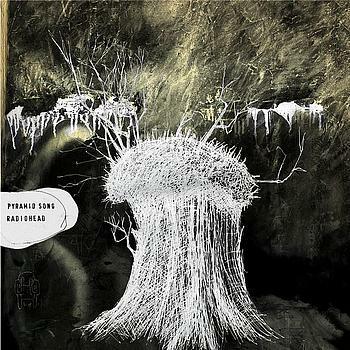 Love Radiohead, I feel that their work after Kid A is a little spotty overall but I really did like a good chunk of Amnesiac, including Pyramid Song (one of the best tracks on the album). Evocative sounds and overall mood, and the lyrics are great. Hadn’t seen this video before but it definitely fits the atmosphere of the song.